More of R. Kelly's uncomfortably melodramatic interview aired this morning on CBS This Morning, as well as a conversation with his two live-in girlfriends. Gayle King continued to speak to the R&B singer, who was out on bail for aggravated sexual abuse charges at the time of the interview. Yesterday (March 6), though, he was detained by police once again, this time over unpaid child support. The latest clips to air on CBS This Morning saw Kelly talking about his financial situation, claiming he had $350,000 USD in his bank account, tried to put it in a new account in the last month and is still waiting for it to be processed — hence being unable to pay bail or child support. He went on to claim that multiple people had access to his account prior to his bank trip and were "stealing" from him. He also denied that he had lost money due to paying out settlements with multiple accusers. Kelly also brought up the issue of child support, yelling between sobs, "How can I pay child support if my ex-wife is destroying my name and I can't work?" He rambled about proposing to his ex-wife Andrea on a helicopter with a puppy and denied ever abusing her. In the Surviving R. Kelly series, however, Andrea claimed that she went through a list of a domestic abuse hotline's 17 determining questions, claiming that there were only two things on that list that Kelly hadn't done to her. "She is not telling the truth," Kelly told King. In the lifetime docuseries #SurvivingRKelly, his ex-wife Andrea described a tumultuous and sometimes dangerous relationship. In addition to the footage of Kelly, CBS also aired King's interview with two young women who claim to be Kelly's girlfriends. Joycelyn Savage and Azriel Clary described their relationship with him, defending the 52-year-old, despite their family's outspoken disapproval and fear for their safety. The 23- and 21-year-olds told King that their parents were manipulative and were only speaking out to make money. Clary even claimed that her parents encouraged her to make sexual videos with Kelly while she was still 17, so that they would have footage to blackmail him in the future. Both sets of parents denied ever asking Kelly for money. Back in the CBS studio this morning, King also revealed that while Kelly had agreed to leave the room while Savage and Clary were being interviewed, he was peering around the corner, sticking his head in the room and loudly coughing continuously throughout the interview to make his presence known. Watch the interview footage with Kelly here; watch the interview with Savage and Clary here. 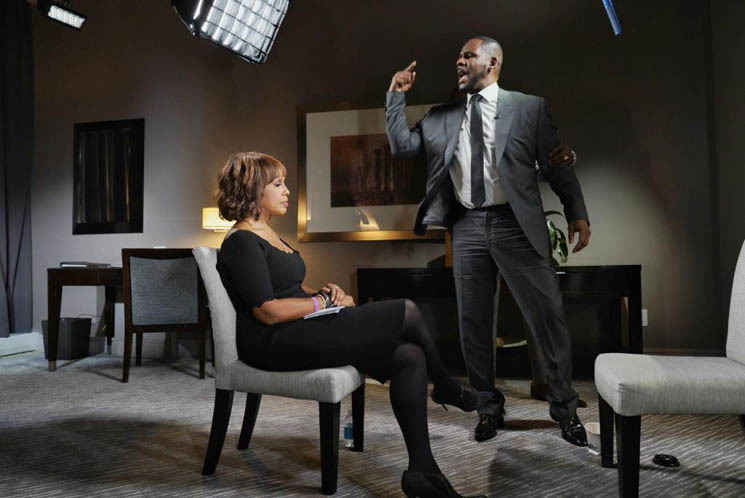 A full special called The Gayle King Interview with R. Kelly will air tomorrow night (March 8) at 8 p.m. on CBS.